Saunders, who is black, told ABC News on Thursday that there were plenty of other cards she found less offensive, but they all featured white couples. 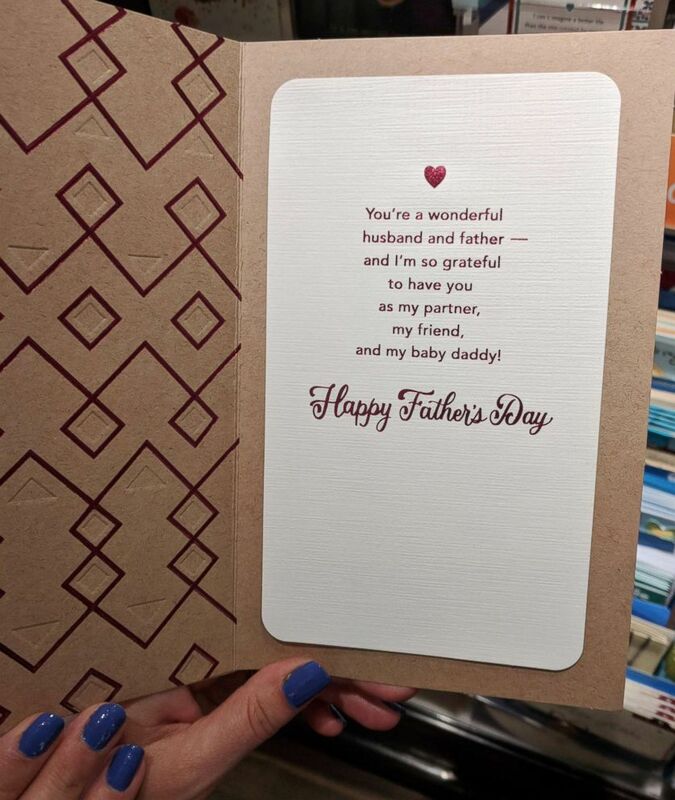 Target stores have pulled a Father’s Day card, depicting a black couple and the words “Baby Daddy”, from the shelves after getting complaints that it is racially insensitive. Her posts struck a chord and triggered numerous complaints to Target, which yanked the card from the shelves of about 900 of its 1,800 stores nationwide that had stocked it. Patrice Molnar, a spokeswoman for American Greetings, which created the card and supplied it Target, told ABC News that the card was sold at about 5,300 drug stores, supermarkets and big-box chains, including Target. “In this instance, this particular card was created for, and addressed to, a loving husband —- which the inside copy makes clear,” Molnar told ABC News. “However, we now see that the front page, taken out of context, can communicate an unintentional meaning that we are strongly against perpetuating and is not consistent with our company purpose and values. We should do better in the future, and we will. “We have notified our store merchandisers to remove the card from all retailer shelves and apologize for any offense we’ve caused,” she added. Saunders said she followed up her online posts with phone calls to both Target and American Greetings to point out why the card was offensive to her. “For me personally, in growing up, a baby daddy or a baby momma was not something that you wanted to be or wanted. It was someone who wasn’t involved in the child’s life … I don’t see my husband in that way,” she said. Still, she said representatives of both Target and American Greetings took her complaints seriously. “And they replied, ‘Hey, yeah we can see that. So we missed the mark on this one. We’re going to pull it,'” Saunders said. She said she can’t accept all the credit for sparking the groundswell of anger that got the attention of two major companies. She said she plans to celebrate Father’s Day on Sunday with her husband and their toddler, who is almost 2 years old.